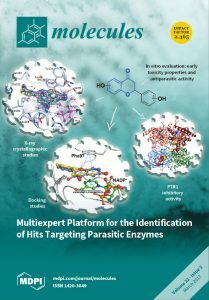 In the New Medicines for Trypanosomatidic Infections (NMTRypI) project funded by the EU and completed in January 2017, in which 13 partners participated, including the HITS Molecular and Cellular Modeling (MCM) and Scientific Databases and Visualization (SDBV) groups, novel anti-leishmanial and anti-trypanosomal hit compounds that inhibit pteridine reductase 1 (PTR1) were discovered. PTR1 is an enzyme of the Trypanosomatid folate/biopterin pathway unique to these parasites and can be inhibited by flavonoid compounds. In the present study, compounds with a flavanone scaffold were synthesized and characterized for their antiparasitic activity and ADME-tox properties. Computational docking studies carried out by HITS researchers Ina Pöhner and Prof. Rebecca Wade (Molecular and Cellular Modeling (MCM) group), along with crystal structure determination, explain the observed differences in the inhibitory activity of the studied compounds against PTR1. Two crystal structures of one compound with different PTR1 enzymes provide a basis for further scaffold optimization to develop inhibitors targeting PTR1 enzymes from different parasites. Publication in Molecules Volume 22, Issue 3 (March 2017) with the front cover image.